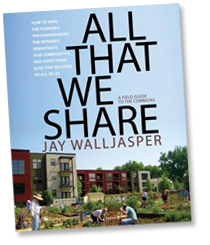 Auf das neue Buch von Jay Walljasper „All That We Share: A Field Guide to the Commons„, New Press, 2010; wollte ich bereits hinweisen, als das Belegexemplar Ende 2010 in meinem Briefkasten landete. Das Buch bietet eine Einführung in die Commons als Potpourri aus Portraits und Kurzbeschreibungen von Praktiken des Commoning weltweit. Julie Ristau von Onthecommons hat eine kleine Einführung geschrieben. Wenn ich das lese denke ich immer: Es kann so einfach sein, dass es fast schon wehtut. Man muss „nur“ ein bisschen umdenken und dann das Offensichtliche tun. Mir ist es recht egal, wie wir es nennen, ob Solidarische Ökonomie, Buen Vivir, Commons oder Gemeingüter solange klar ist, dass es sich um eine Vielfalt sozialer Praxen handelt, deren Grundüberzeugungen sich decken. Um welche Grundüberzeugungen und Logiken es dabei geht, hatte ich hier zusammengefasst. “At a recent meeting of a common security club in Boston—one of many groups around the U.S. where people come together to discuss ways to help each other get along in these insecure economic times—someone raised the idea of a tool exchange. Neighbors could take inventory of who owns a snow blower, jigsaw, wheelbarrow, extension ladder, hedge shearers, shop vacuum, various drills, shovels, rakes and other gear that folks could share. Commoning is built upon on a network of social relationships (based on the implicit expectation that we will take care of each other) and a shared understanding that some things belong to all of us and must be used in a sustainable and equitable way—which is the essence of the commons itself. of the Industrial Revolution. They were known as “commoners.” Hence the word “commoning” describes people living in close connection to the commons. The loss of the commons robs people of their autonomy to meet our basic needs for sustenance, economic security and social connections. Thus, commoning involves taking your life into your own hands rather depending on corporations and other outside forces to sell you what you need. It’s a way to resist the dominant paradigm of modern life, which insists that what’s bought and sold in the market economy provides fundamental meaning to our lives. It’s a way to tap into hidden chamber within our imaginations, which harbor vivid images of different ways to live. Dieser Beitrag wurde unter Beispiele für Commons, Commons, Gemeinschaft, Gemeinwohl, Organisation abgelegt und mit Commoning, Jay Walljasper, OntheCommons, Peter Linebaugh, Sharing verschlagwortet. Setze ein Lesezeichen auf den Permalink.